← UltraLight A – Z Needs Your Support! As can be seen in the video, I ended up with not quite enough SilNet to get the job done. Like I said, I had previously used a small portion of the tube I used, however, I feel like if it were to have been a new tube, it would have been enough. So, I now need to order some more and finish the job. This is fine anyway, because I like to have some available for those other small jobs… Once I get the rest of it seam sealed though, then I will take it out for a water hose test! Also, like I said in the video, I found that if I squirt the SilNet in a zig-zag pattern it seems to cover the stitches more evenly than just running a straight line. I would only run a bead about 2 feet long at a time, this way I could take my time squirting it out of the syringe, and the SilNet would not begin to set-up before I smoothed it out. Then I simply used my finger (with the latex glove on) and slowly wiped down the seam. I tried not to go back and fix spots unless absolutely needed because by going back it would sometimes make it worse. I found that if there were spots that needed fixed, it worked better to use a little dab once it dries. This entry was posted in DIY/MYOG, Gear, Tent and tagged DIY Seam Sealing, Seam Sealing, SilNet, Six Moon Designs, Skyscape Trekker. Bookmark the permalink. Any updates on how well this tent is holding up and keeping water out? I have only used the tent in my yard so far. Immediately after I got the tent I also got my first hammock, and to be honest, I have been really happy with it. Not to mention that I have been pretty busy and not had as many opportunities to get out much this part of the year. To be honest, the rest of the year will probably not warrant many overnight trips at all… (Bummer). As far as keeping water out, I tested it in a thunder storm one day and found a few areas I needed to hit again. I do believe that next time I seam seal an item, I will mix the mineral spirits and silicone rather than use the silnet. I think that I can get it a touch thinner and be able to work it into the seams a little better. When I seam sealed mine I used exactly the whole tube. I wish I had watched your video first though. Could have saved me some time. I used the little brush that came with the tube… I have been really happy with the Skyscape overall. No condensation. Do you have any concerns about putting one of your trekking poles through the top of it during setup? I thought about trying to come up with some type of cap that would slip over the tip of my trekking poles. Do you put them in set at 45 inches or do you put them in and then expand your poles? Thanks for the video! I do not put my poles inside it with them fully extended. My trekking poles are 3 pieces so I set one section at the 115 cm mark and then insert it in the Pex tubing sleeve. Then I extend the other section of my pole to the 115 cm mark. I do the same on the other side. Stick- nice video, I just finished seam sealing my new tent too. Where did you get the syringe, I.m making a stuff sack and want to water proof the seams, and would like to try a new technique for me. I actually brought the syringe home from work. I checked out your post. Very nice. Thanks for the link. I like your idea about using a toothpick to get in the crevasses where tie outs are. That is one area that I had to touch up, but I think I have them now. Also, the next time I seam seal something this big, I am going to do the same as you and mix the concoction rather than use SilNet. 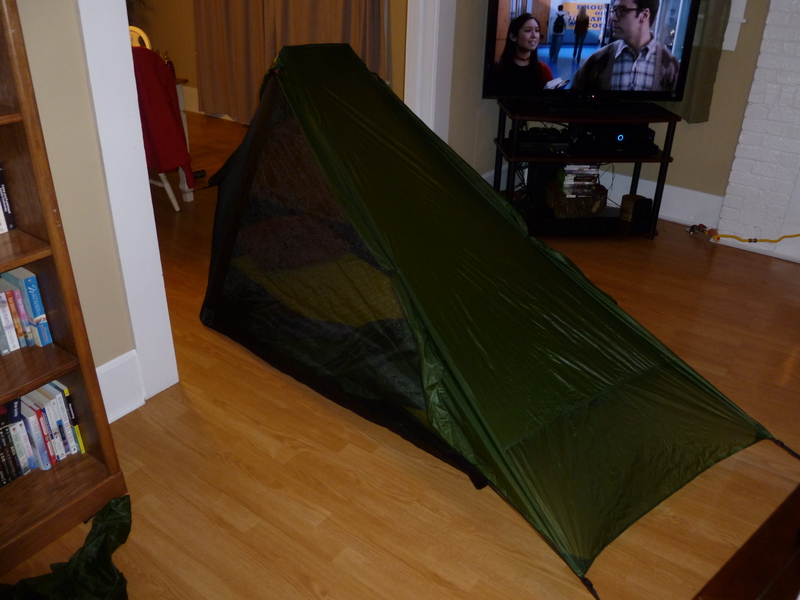 The first time I tested the seam seal, I set my tent up outside and used the water hose. I let my children sit inside and told them to watch for leaks…well, that didn’t work out so well, but they had fun inside the tent! Haha. Anyway, I was hoping it would rain again today, but no go. And I have worked all weekend so I am too tired to go outside now and test it with the water hose. Maybe tomorrow…. Great video. About time someone showed the sealing in detail instead of just talking about it. I think that will be a great help to a lot of folks. Glad it could be of some help. Thanks for stopping by and checking out my blog!